Making these hand-beaded bracelets gives working moms in Colombia flexible hours and steady income. Helen Keller said, "The best and most beautiful things in the world cannot be seen or even touched—they must be felt with the heart." These handmade bracelets do look lovely, but it's their story that will fill your heart. Hand-beaded using sparkling pearls of Japanese glass, each bracelet is crafted by a female artisan in Colombia. Because she's able to work flexible hours from home, she earns a sustainable income on her terms, while caring for her children. 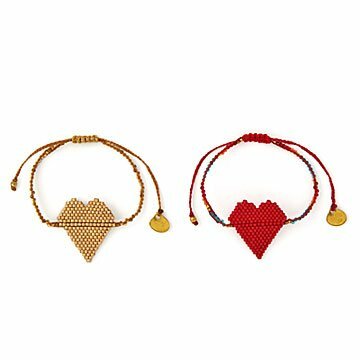 Available in bold red or a heart of gold each empowering piece makes a fashion statement while helping to make a difference for a family. Designed by Tita Navia. Handmade in Colombia. In a past life, Tita Navia was a successful senior international manager at a well-known advertising agency. When she left, she returned to her home country, Colombia, to build her own brand that not only creates beautiful jewelry designs, but also incorporates a sense of social responsibility into everything they do. Tita’s artisan jewelry is inspired by her Latin American heritage, with a nod to international fashion trends. She incorporates bold colors and fun concepts into her designs, while relying on quality and craftsmanship to make her pieces truly special. Each piece is made with love by women artisans in Colombia, many of whom are mothers working flexible hours from home.